Confined as I was to plant and rock photography all winter, I ached to go somewhere known for wildlife. 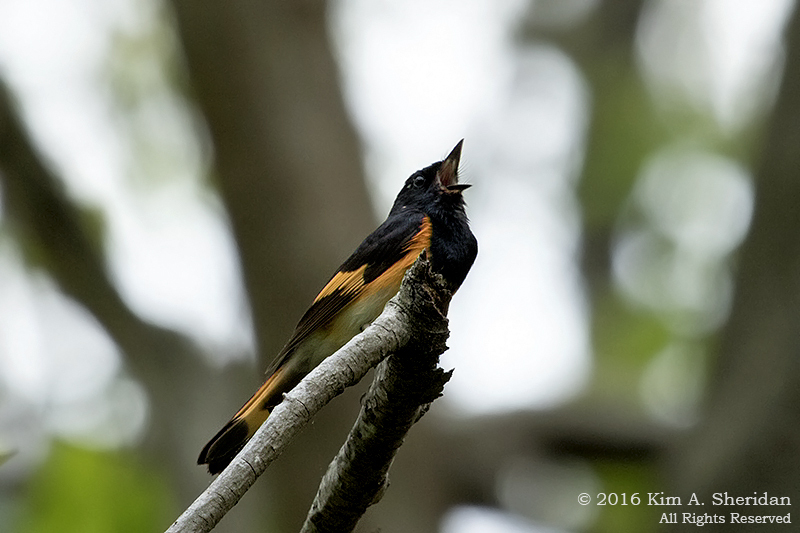 Bombay Hook NWR in Delaware beckoned. My Facebook feed had been full of close-up photos of the wonders to be seen there. Foxes. Owls. 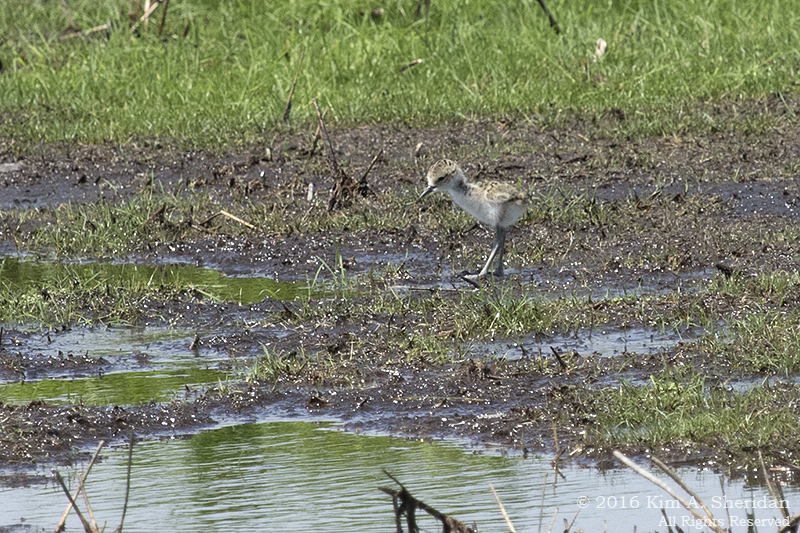 Meadow birds like Bobwhites, Horned Larks and Meadowlarks. Raccoons. Foxes. Bald Eagles by the dozens. 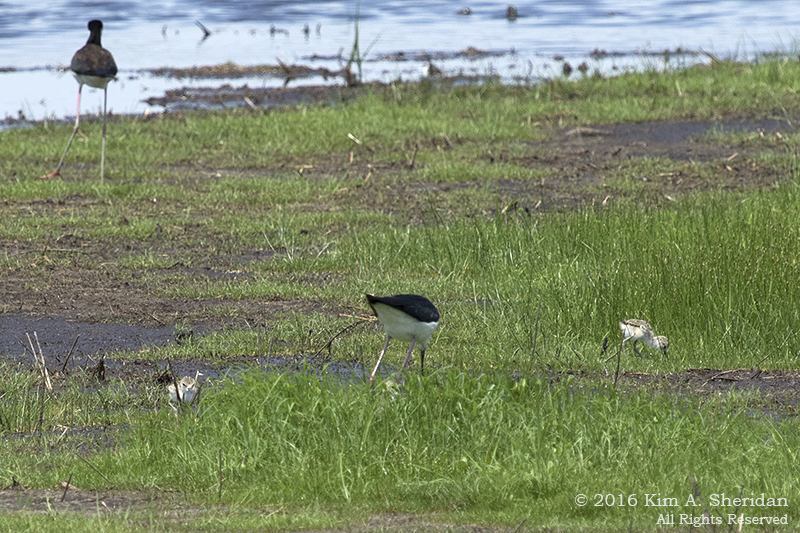 Glossy Ibises. 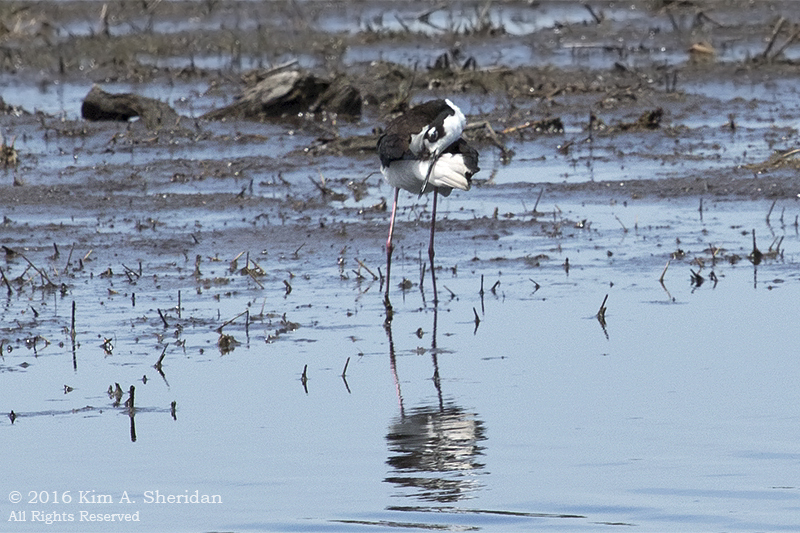 Avocets and Black-necked Stilts. Did I mention foxes? Getting to Bombay Hook felt jinxed. Something always went wrong. In January, a trip was planned with a group of photographer friends – and it was too rainy. In March, a trip was planned with another friend – and he was under the weather. 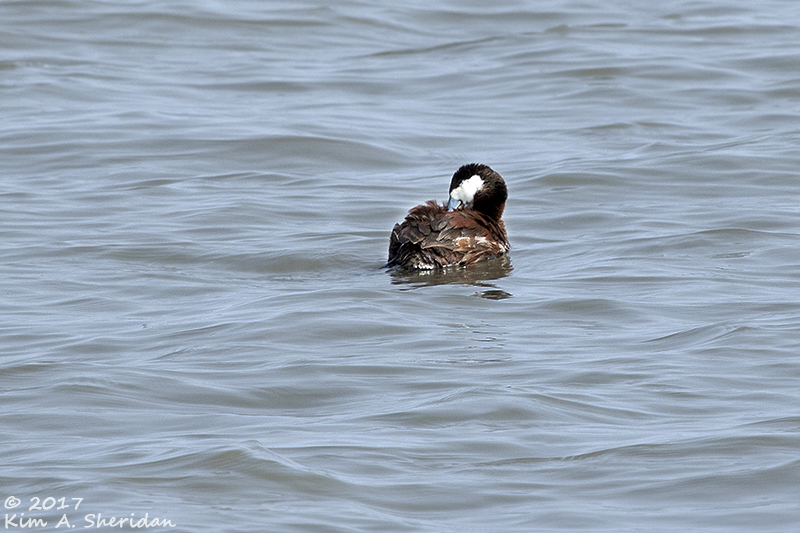 Finally, in mid-April, all the stars aligned, and I made my much-anticipated visit to Bombay Hook. 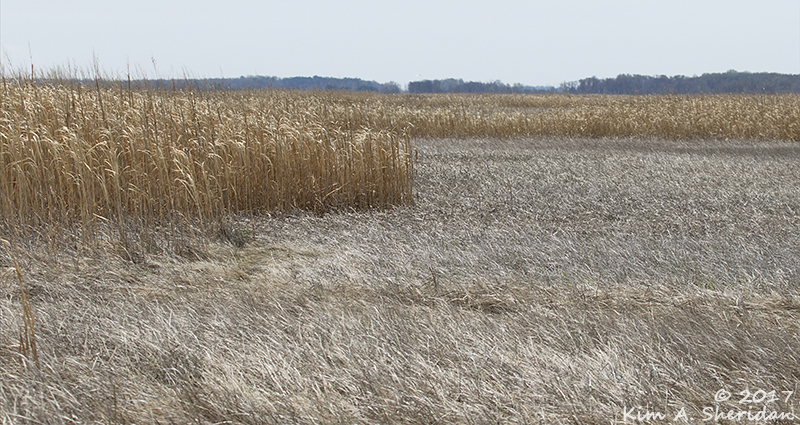 The landscape was still wearing its winter coat of dried tan grasses. No Bobwhites or Horned Larks lurked in the meadows and grassy areas. I set out on the Wildlife Drive to see what I might find further afield. 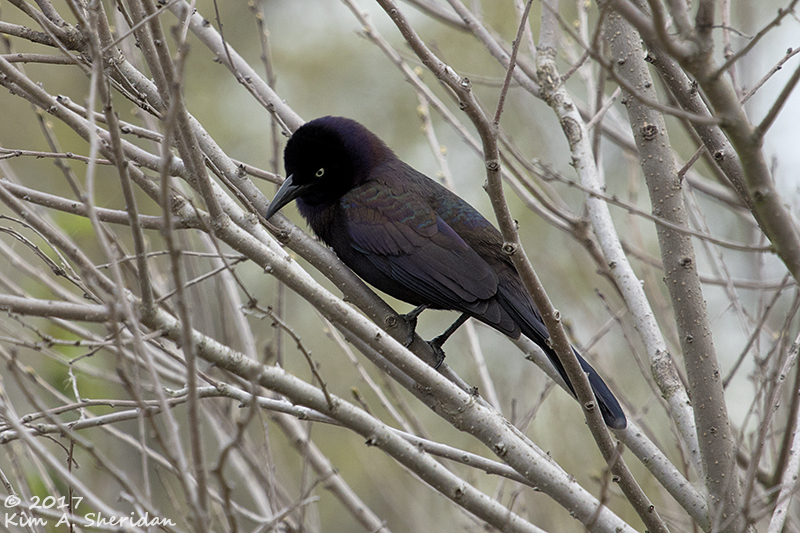 My first bird was – a Grackle. Common, I think. Not usually what one would consider a pretty bird, but look closely at the iridescence of the feathers. 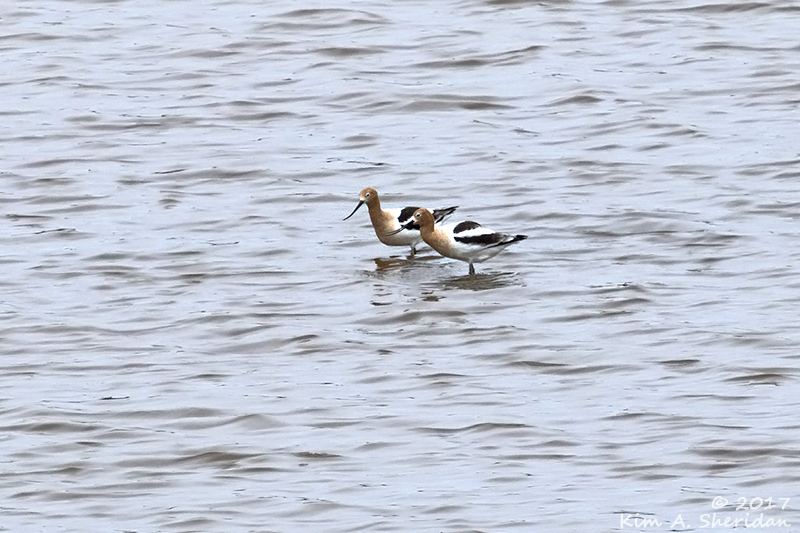 A handful of American Avocets graced Raymond Pool. Most of them were too far off to photograph. One of the downsides of wildlife photography on a budget. 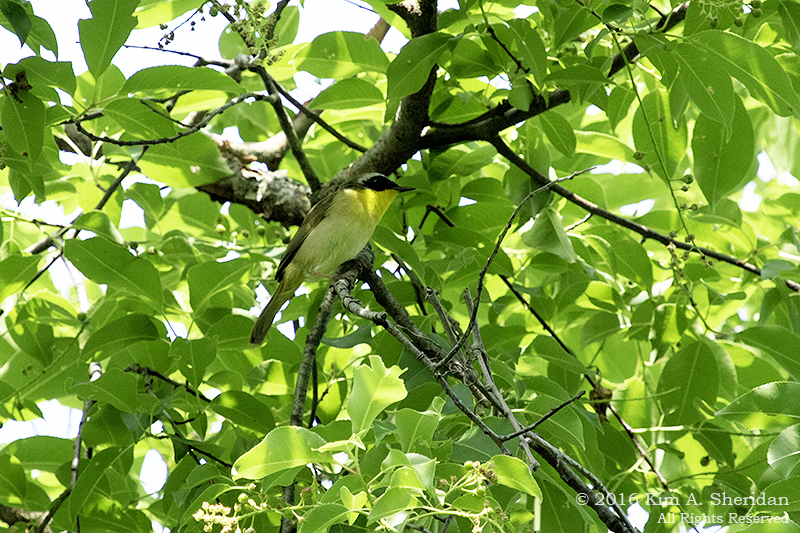 I was lucky that two wandered a little closer. 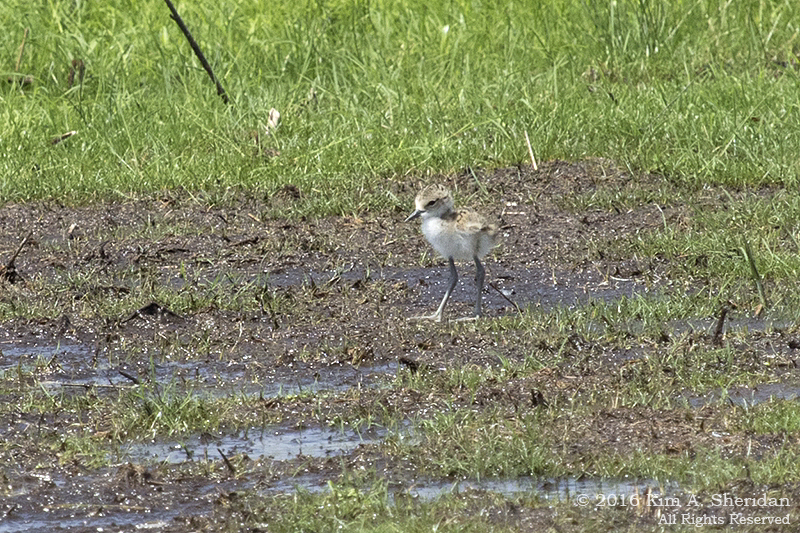 Photography at this distance is marginal at best with my 400mm lens – I’m really stretching the limit here. But I do love this bird. 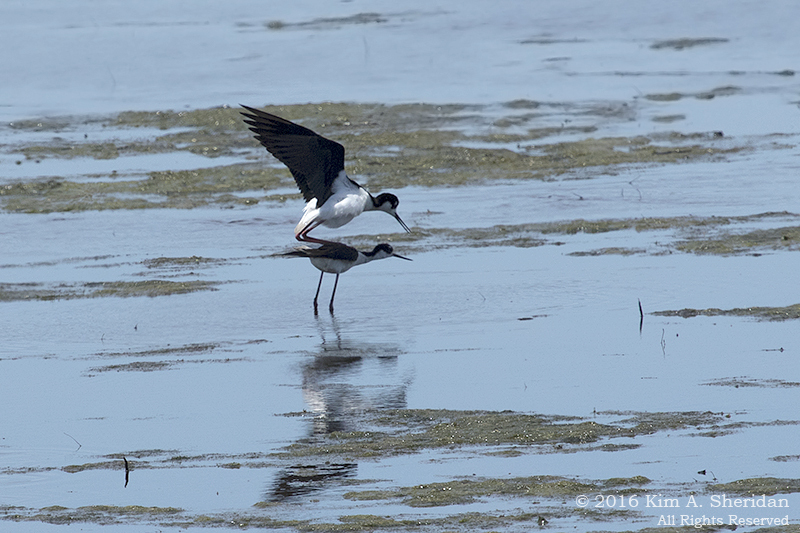 Avocets are one of the bird species that we don’t see at John Heinz NWR, but they are common just a little farther south in Delaware. These birds alone are worth the trip. 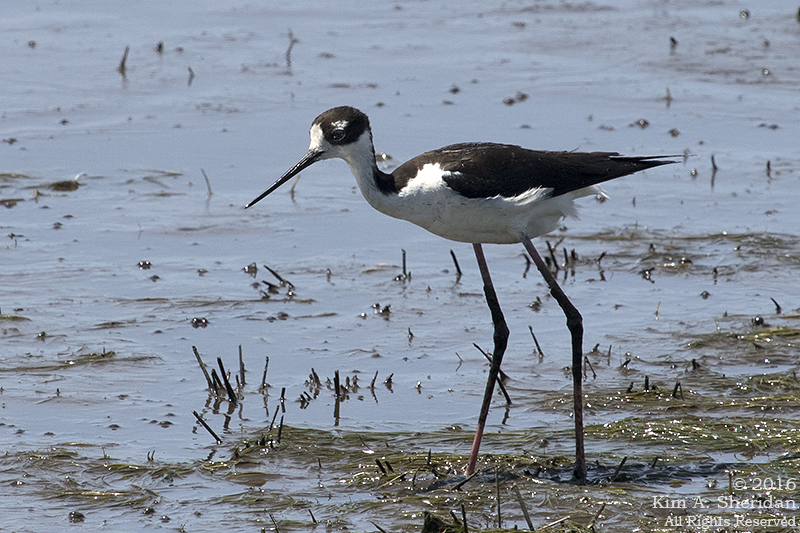 I also saw two Black-necked Stilts, another mid-sized sandpiper that are a Bombay Hook specialty. They didn’t want to pose, however. No sign of foxes yet. 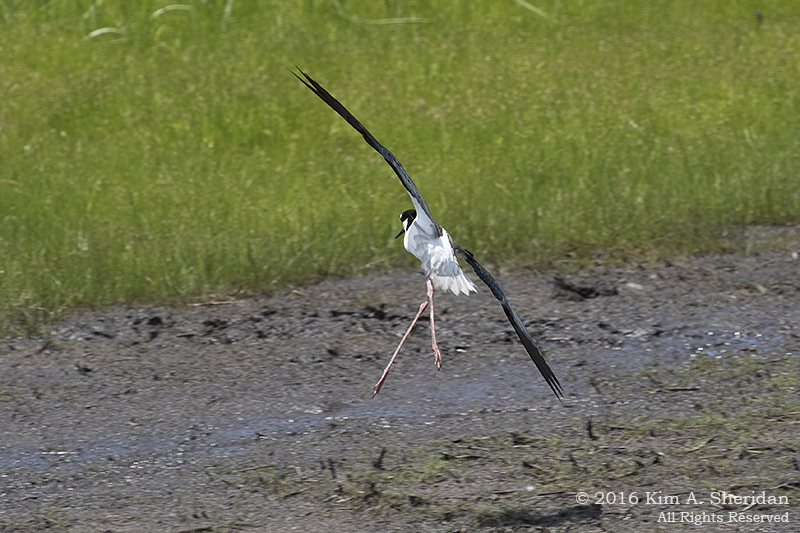 I wondered what I might see on the Salt Marsh boardwalk trail. 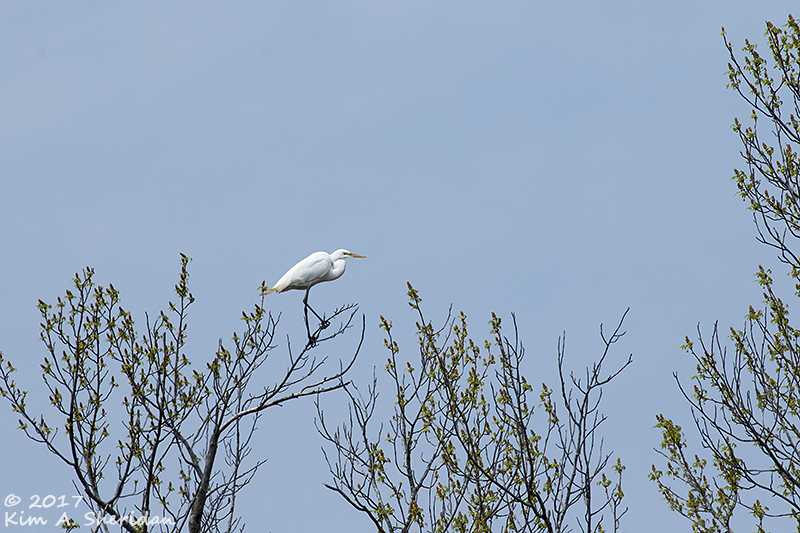 Ah, a Great Egret, at the top of a tall tree. 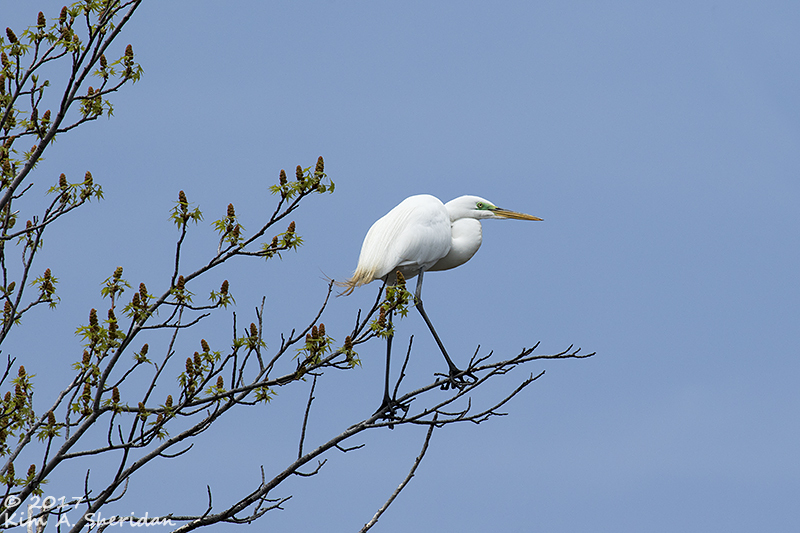 I’m always startled to see an Egret in a tree. 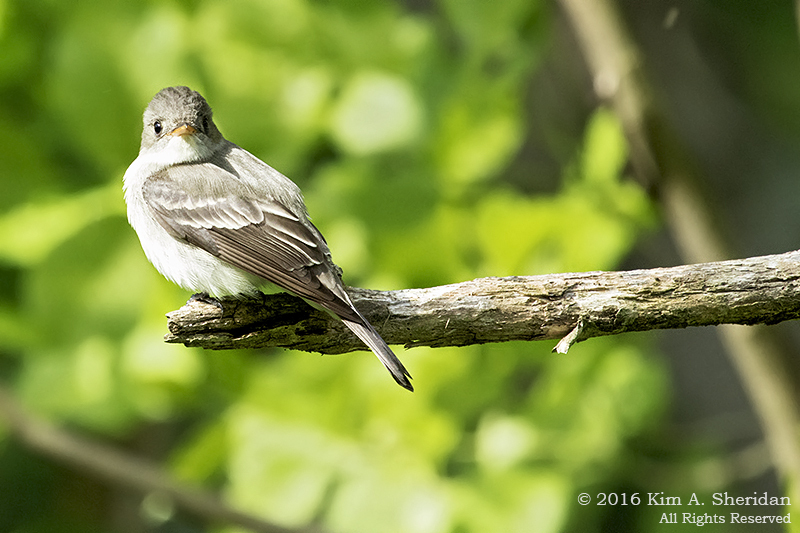 Seems far too big to be perched on that thin branch. Wading in shallow water is a much safer place to be. 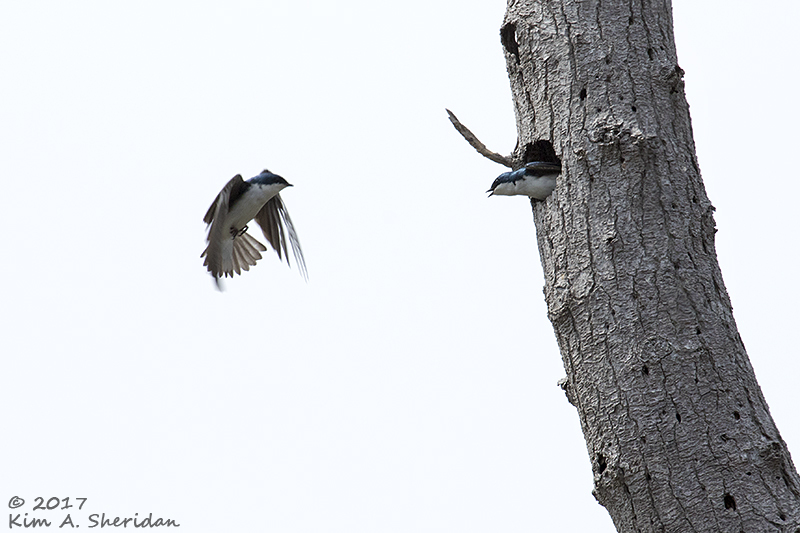 Nearby a pair of Tree Swallows were bickering over a tree cavity. 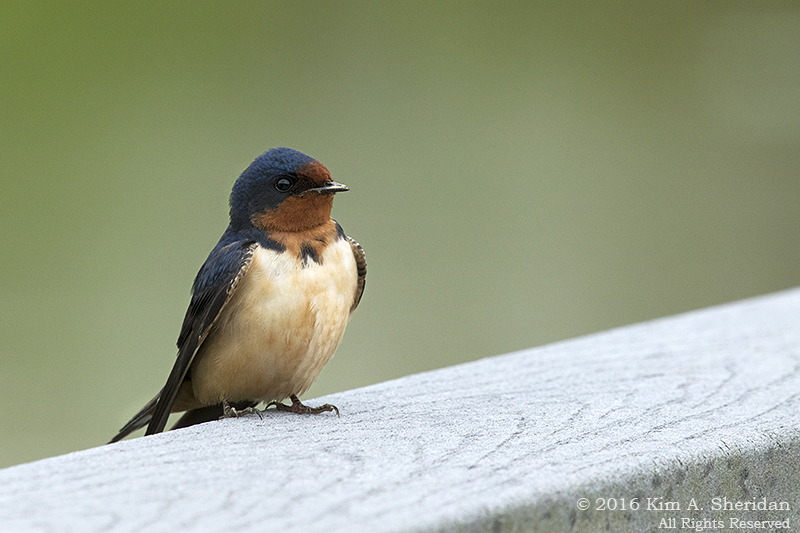 Swallows argue a lot. There’s never enough housing on the market. 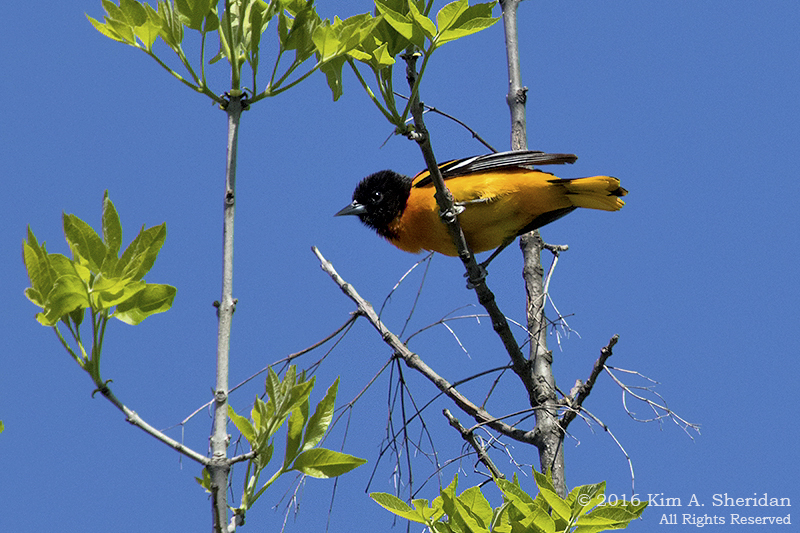 Back on the road, I came across another bird not known for its beauty. 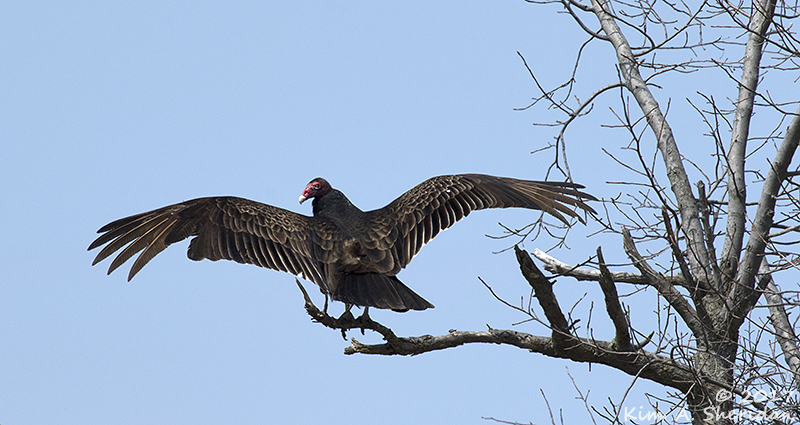 Usually I see dark-faced Black Vultures at Bombay Hook, but this one’s a real turkey – a Turkey Vulture. Sunbathing in vultures serves two purposes. At night, they keep their body temperature at a lower level, and so often spread their swings in the sun to warm up. 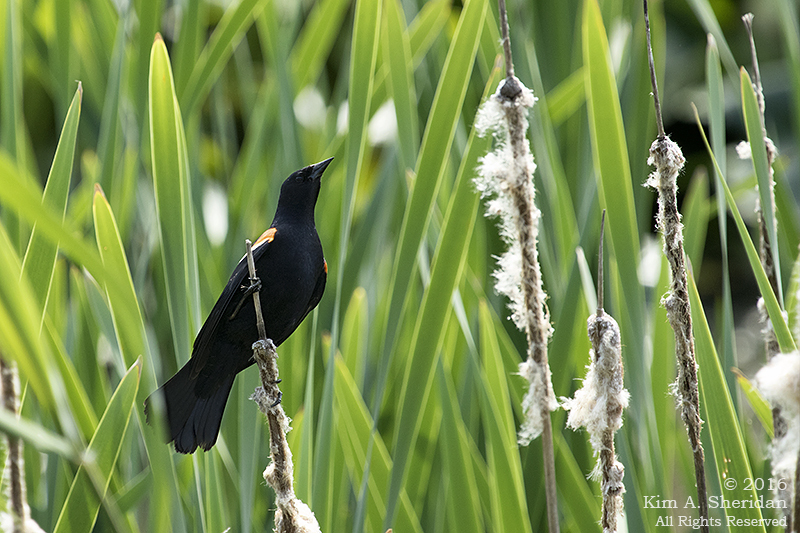 It was one o’clock in the afternoon, though, so it seems more likely this fellow was drying his feathers. 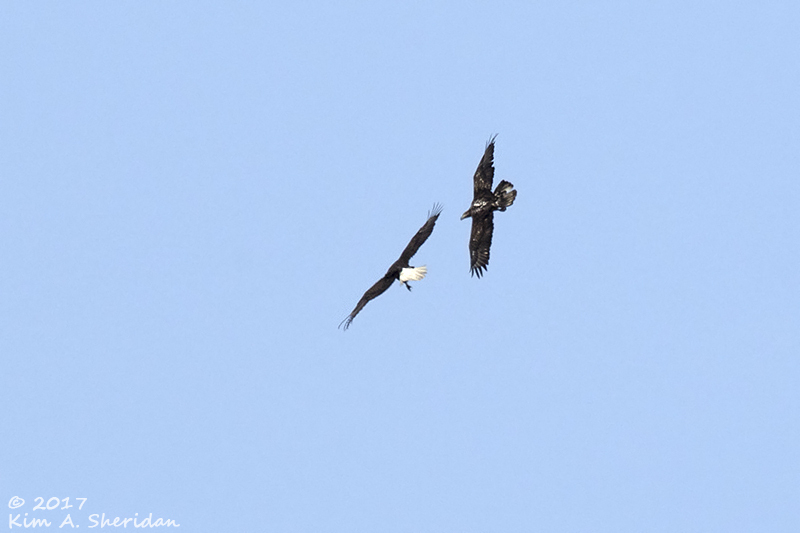 Bald Eagles flew past, the juvenile chasing his elder. They say imitation’s the sincerest form of flattery. I doubt the adult appreciated this expression of adulation. 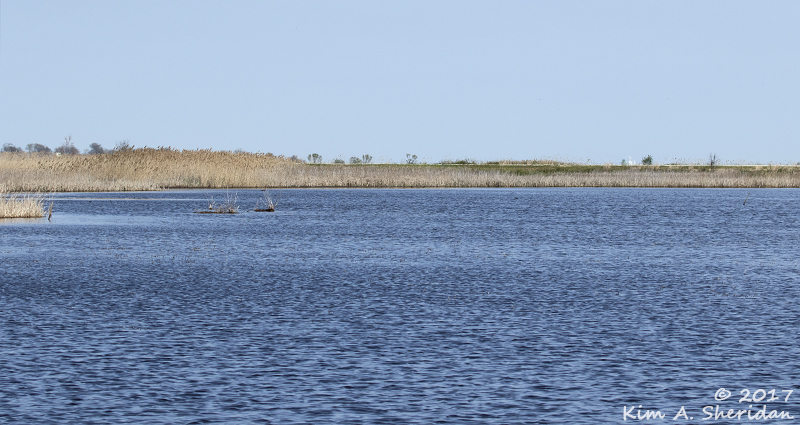 Far across Raymond Pool I saw several Bald Eagles standing in the shallow water, looking down. This was curious behavior. Were they looking for fish? Admiring their reflections? Maybe, like me, they couldn’t get enough of the deep blue water sparkling in the sun. 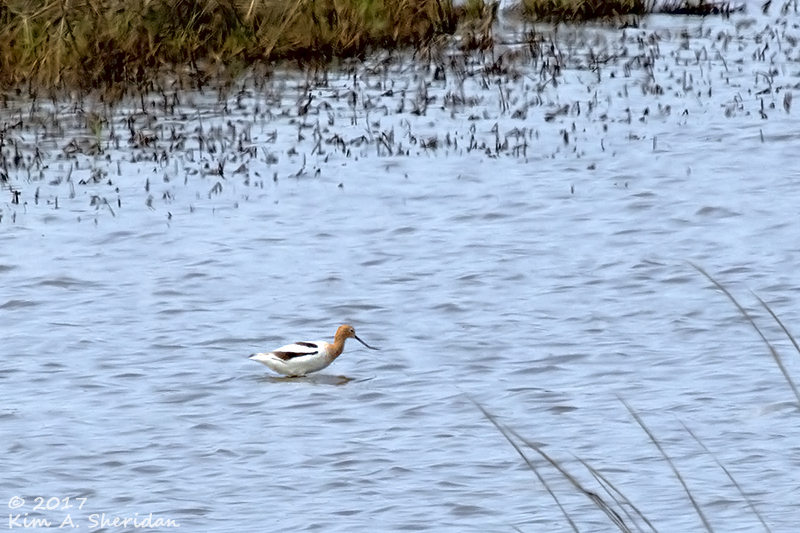 On the ponds, there were large numbers of Northern Shovelers and Green-winged Teals. Again, out of range of my camera. 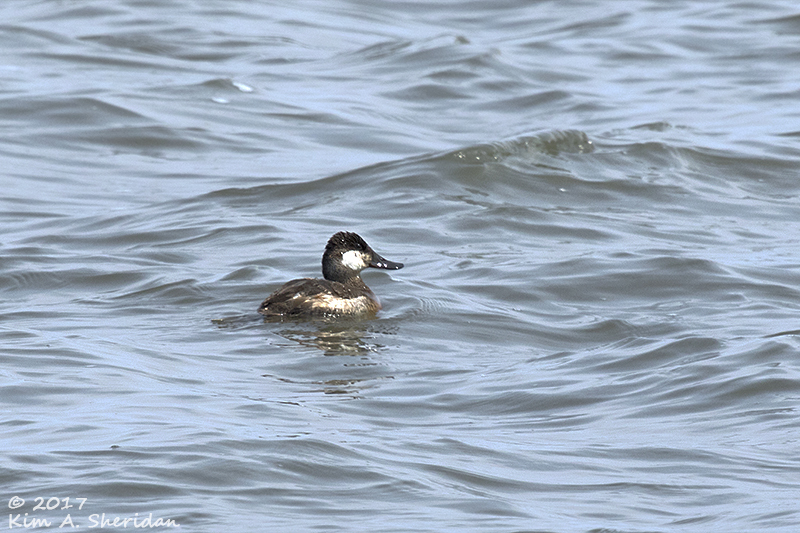 On the bay side, however, a small flock of Ruddy Ducks bobbed close to shore. 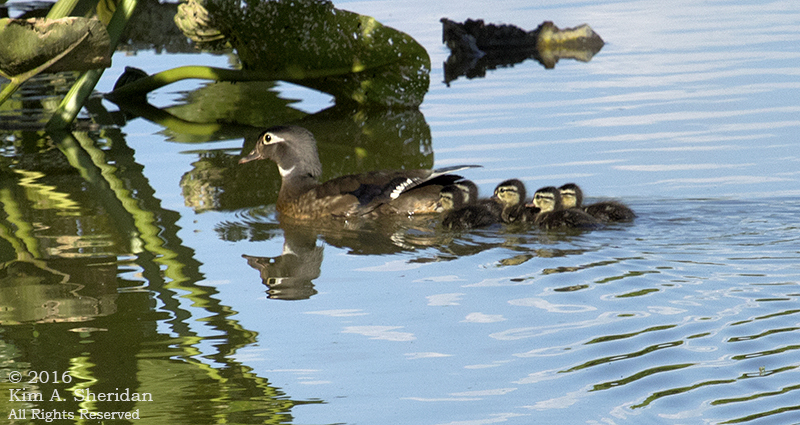 Ruddies are neat little ducks. 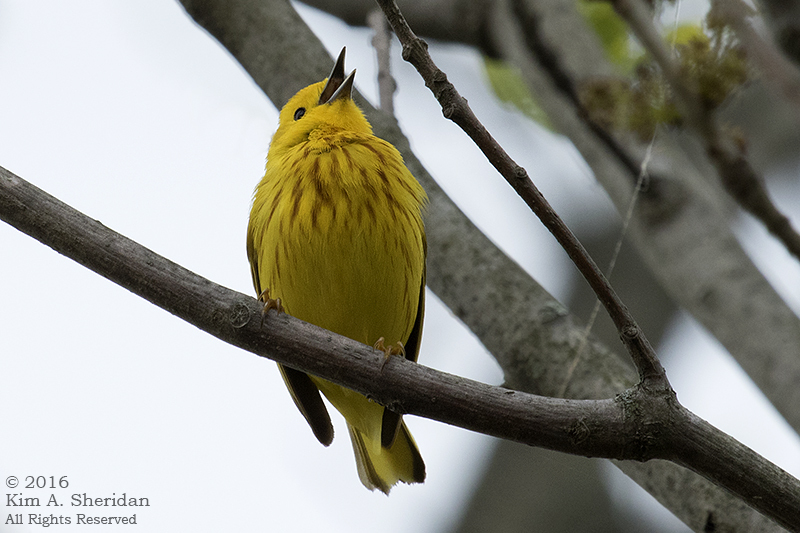 Males sport a blue bill and marvelous cinnamon plumage in breeding season. Did I ever see my fox? Nope. I drove through the meadows near Finis Pool, hoping to see one, or perhaps a Horned Lark or Meadowlark. No such luck. Nor did I see owls at Bear Swamp Pool. All is not lost. 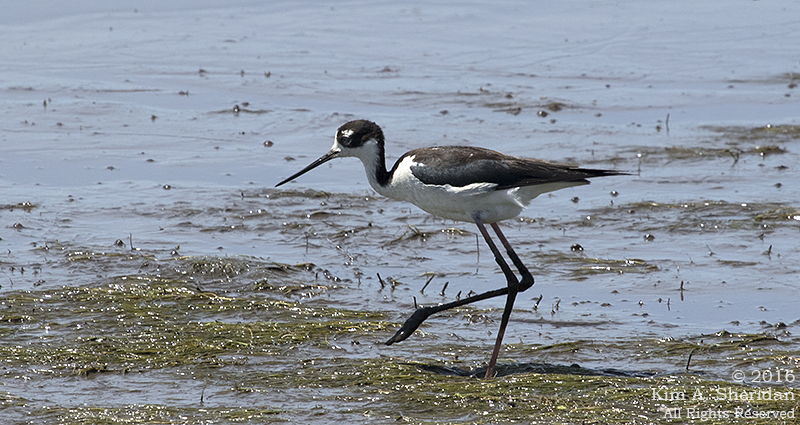 A Lesser Yellowlegs pranced near Parsons Point. Wildlife photography is challenging. You have to put yourself in the right place at the right time. 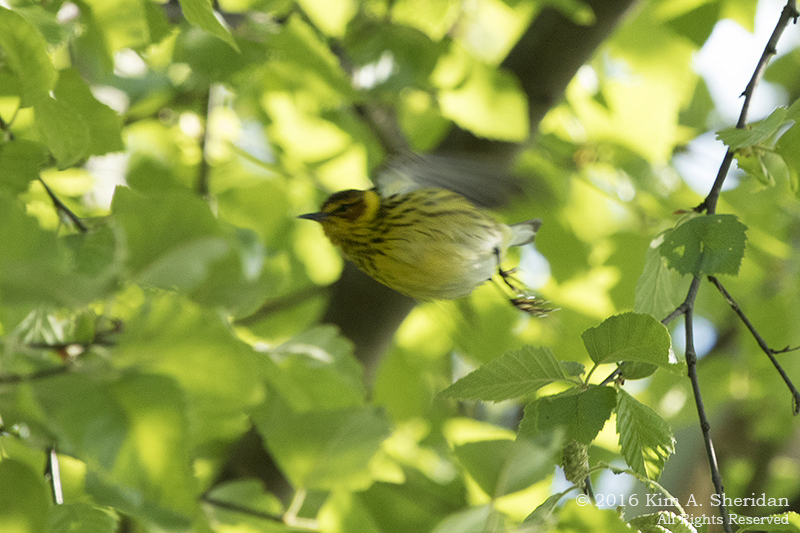 Then you have to be patient enough to wait in one spot until the critters get within camera range. That means ignoring all of Bombay Hook except that one spot, something I can’t bring myself to do. I might miss something! So I make the most of the opportunities that present themselves. 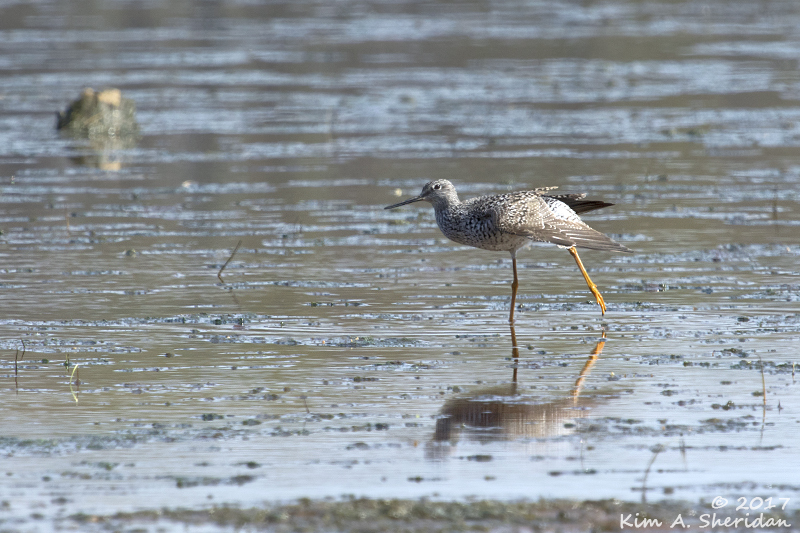 Like this Lesser Yellowlegs, doing a little yoga. 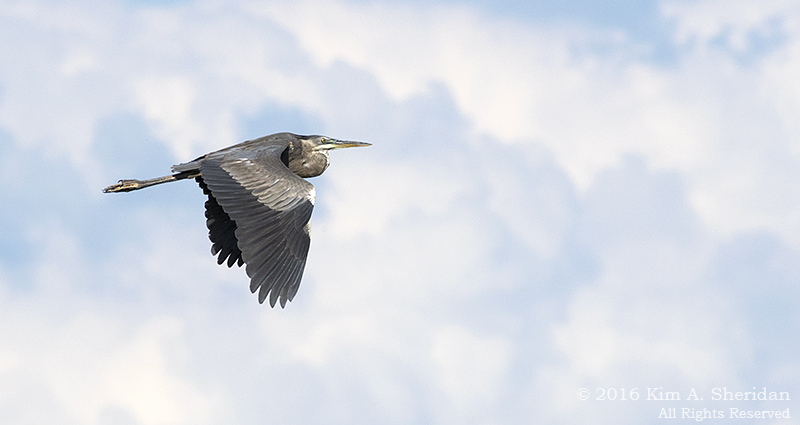 After a winter spent too close to home, it was good to stretch my wings a little. 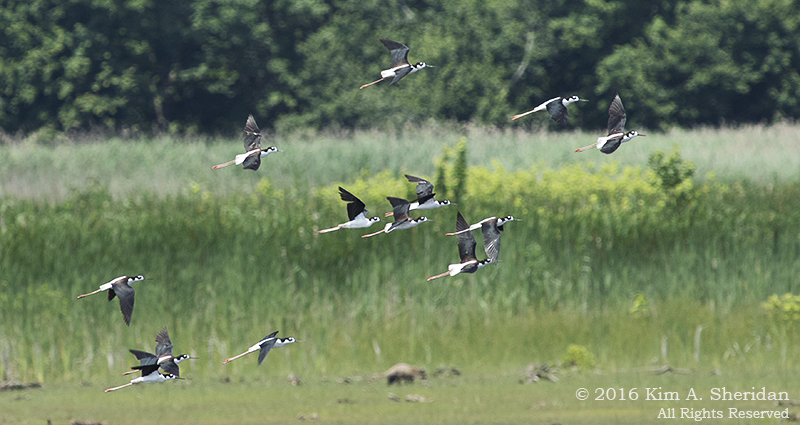 Just being at Bombay Hook, watching the critters do their thing, was enough for me. The third time’s definitely the charm! 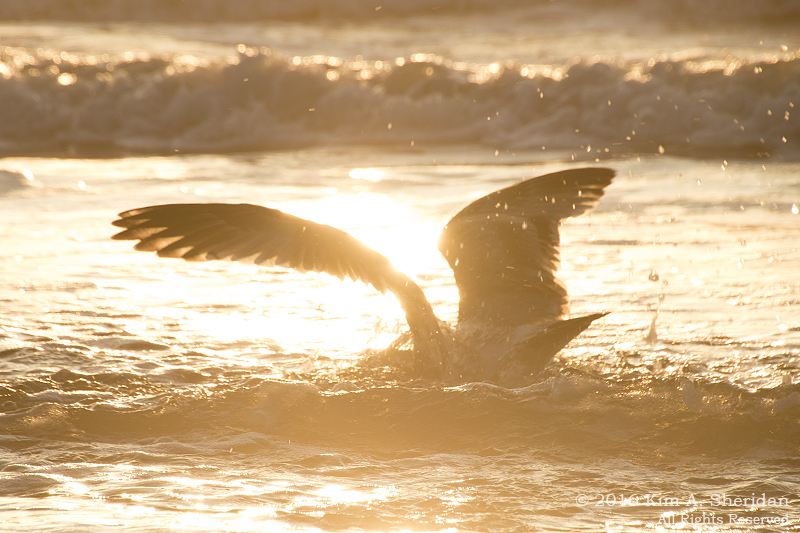 The sun rises on a new day, setting the sea aflame in glittering gold. This beauty is of no consequence to a Herring Gull. Neither is the turbulent surf. Just another day at the office. Taking wing and then diving, he expertly snatches breakfast on the go. 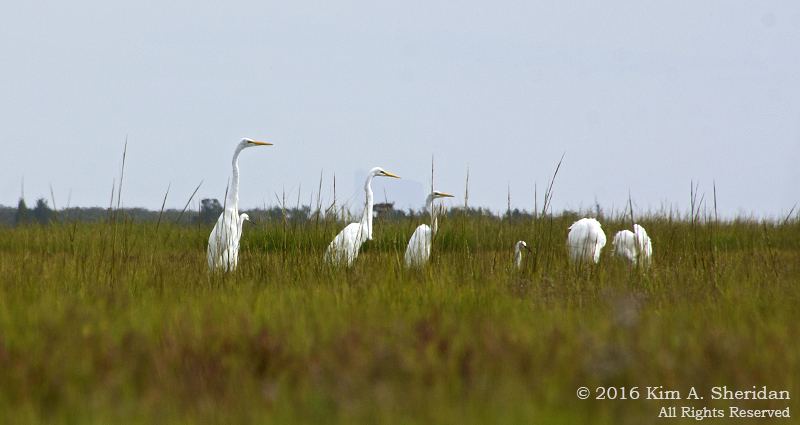 Out on the marsh, Great Egrets congregate. Three stand watch while others attend to their beauty routine. 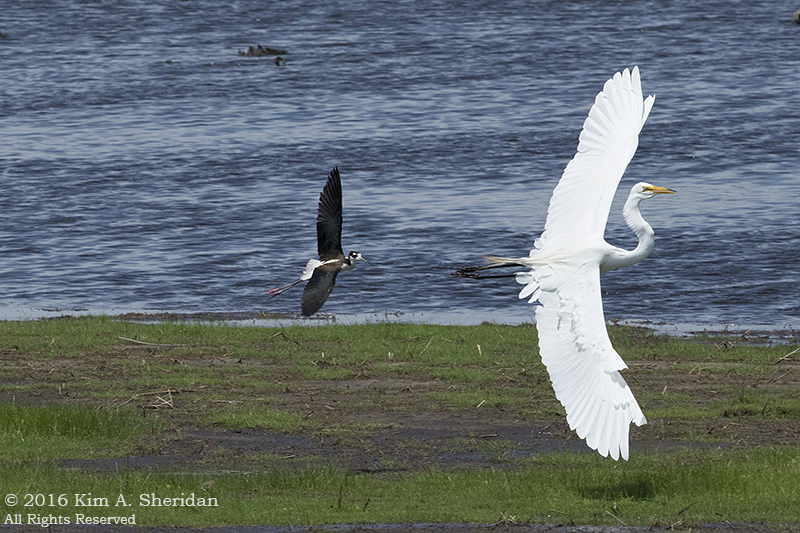 Behind them, Snowy Egrets look for a midmorning snack. 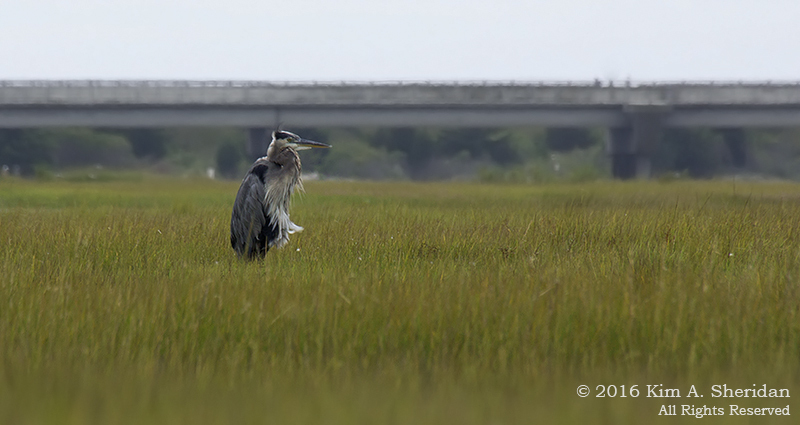 Ruffled by the wind but not the bridge traffic in the distance, a Great Blue Heron surveys a wide expanse of saltmarsh cordgrass. 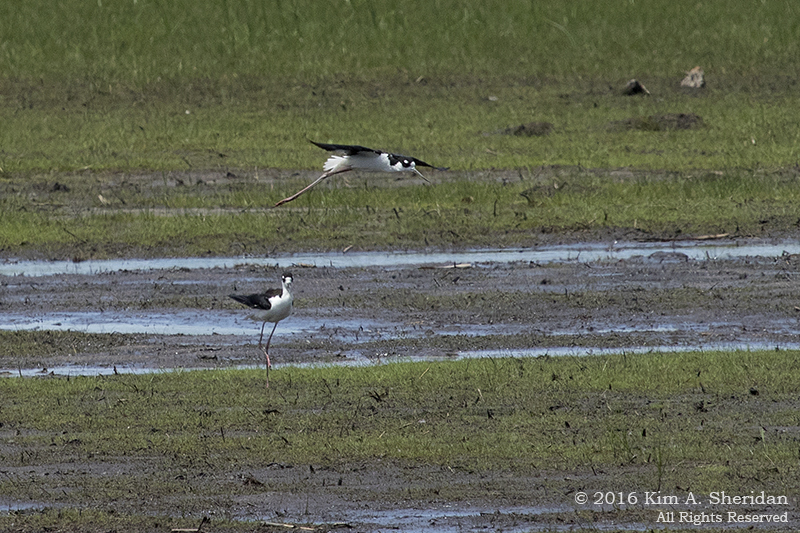 On the mudflats, Yellowlegs forage. 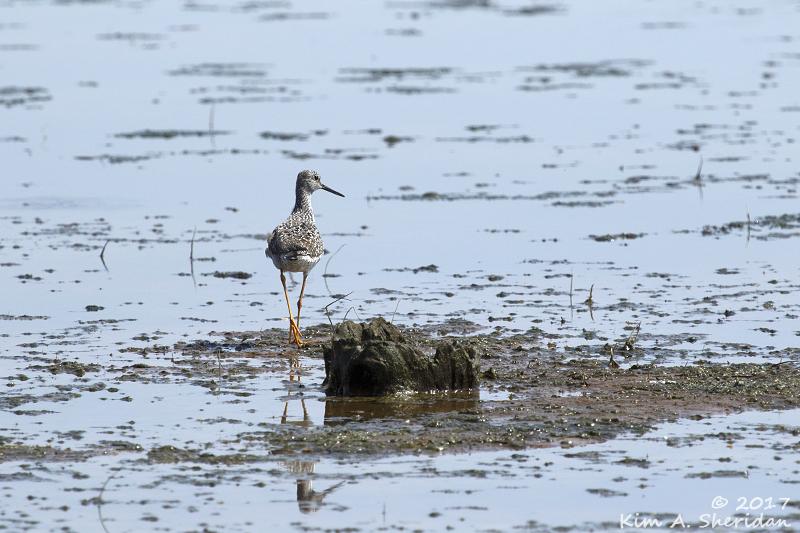 Greater Yellowlegs? 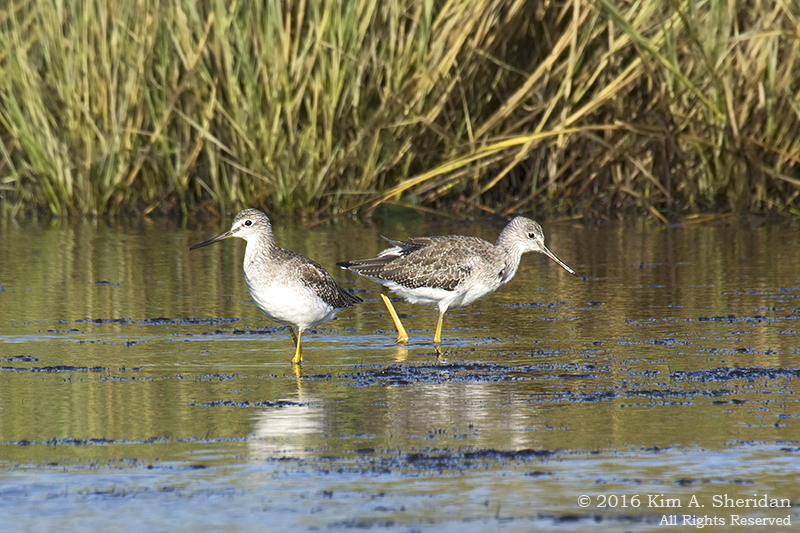 Lesser Yellowlegs? Or one of each? Who’s to say? The beach is a ballroom brimming with tuxedoed birds. 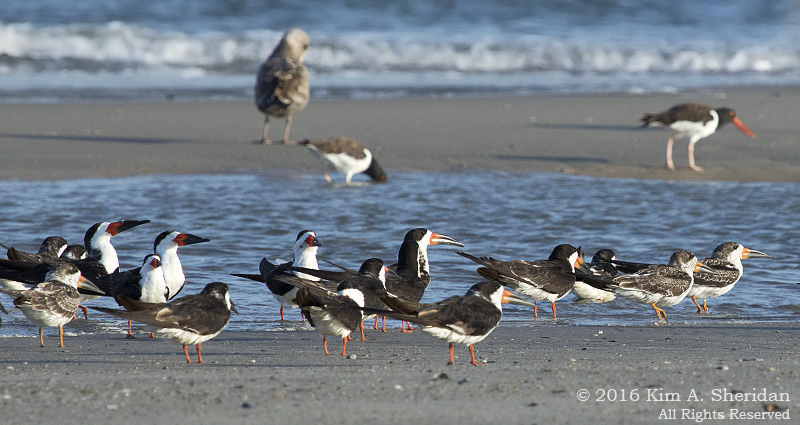 Black and white with orange-red accents, these Black Skimmers (front) and American Oystercatchers (rear) await the next dance. My, what big eyes you have, grandmother! 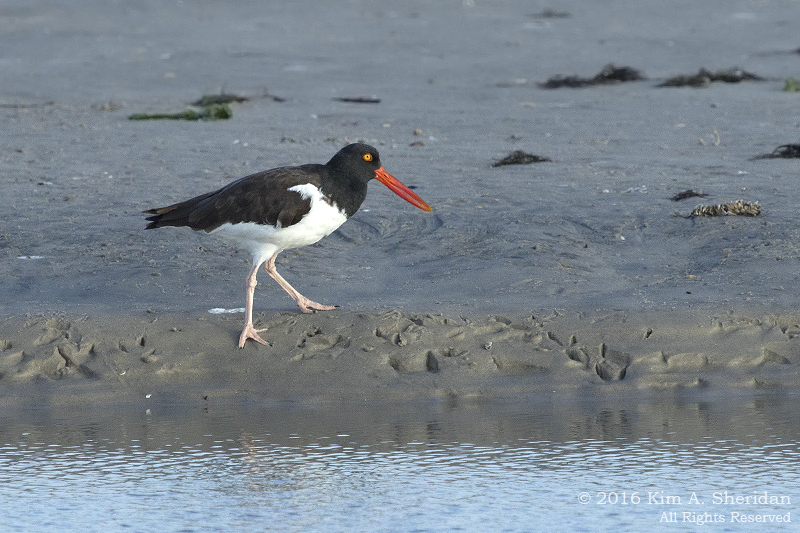 The American Oystercatcher enhances its clownlike appearance with oversized pink feet and a long red bill. Ahhh, lunch! Oysters are not on the menu today, but crabs are. 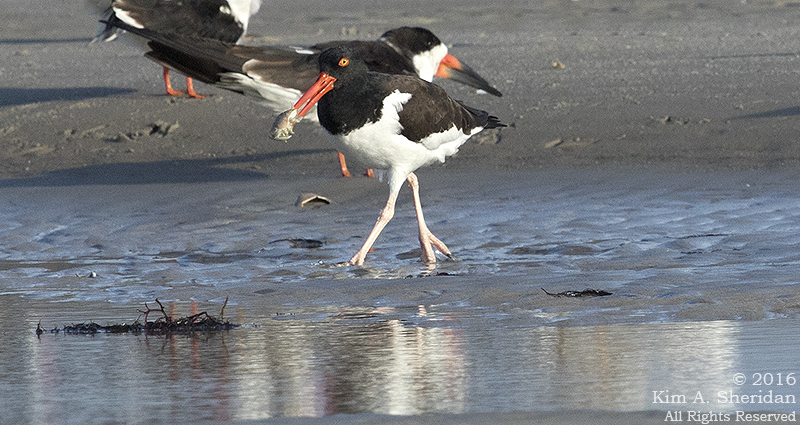 This Oystercatcher carries his entrée into a nearby puddle. Apparently, it’s considered good manners to wash one’s food before one eats it. How to tell these birds apart? 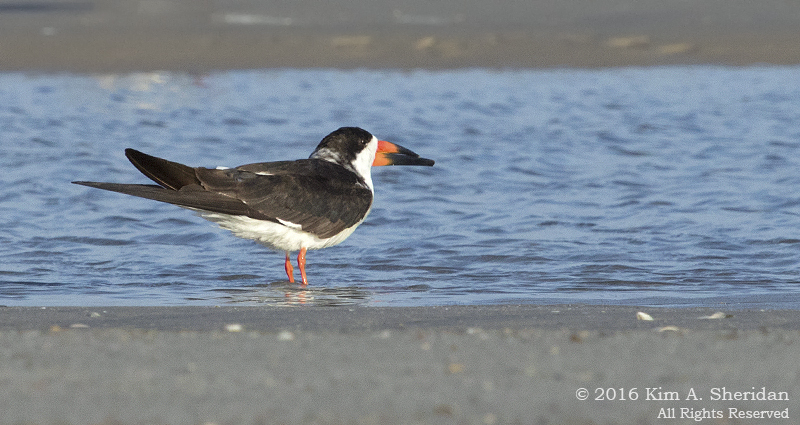 The American Oystercatcher has an all-black head, red bill, and those marvelous red-rimmed golden eyes. 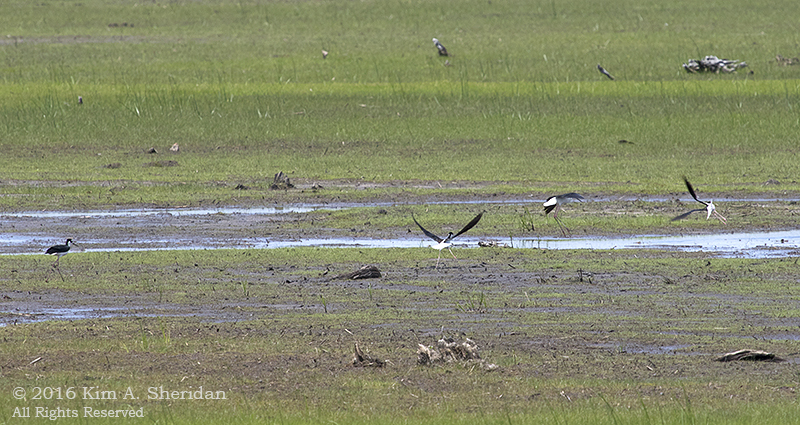 The Black Skimmer in the background is a stockier bird with a white chin and unremarkable dark eyes. But then there’s that bill. Razor thin, with a lower bill much longer than the top. 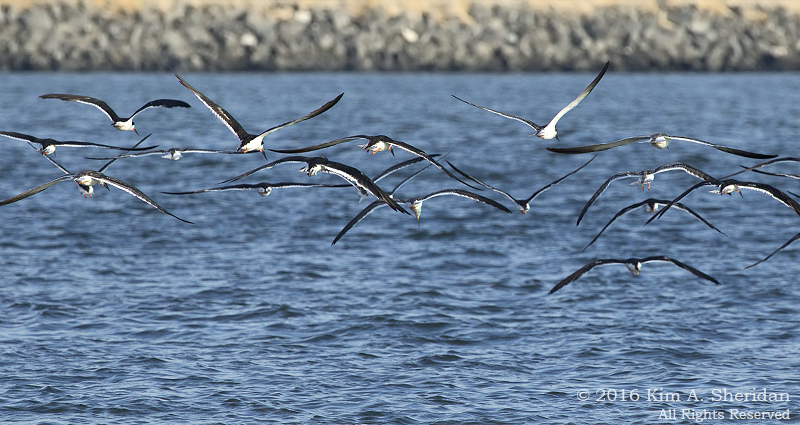 Skimmers feed by flying over the water, bill open and lower mandible cutting through the surface. The bill snaps shut as soon as it touches a fish. Gotcha! After lunch, it’s time for preening. 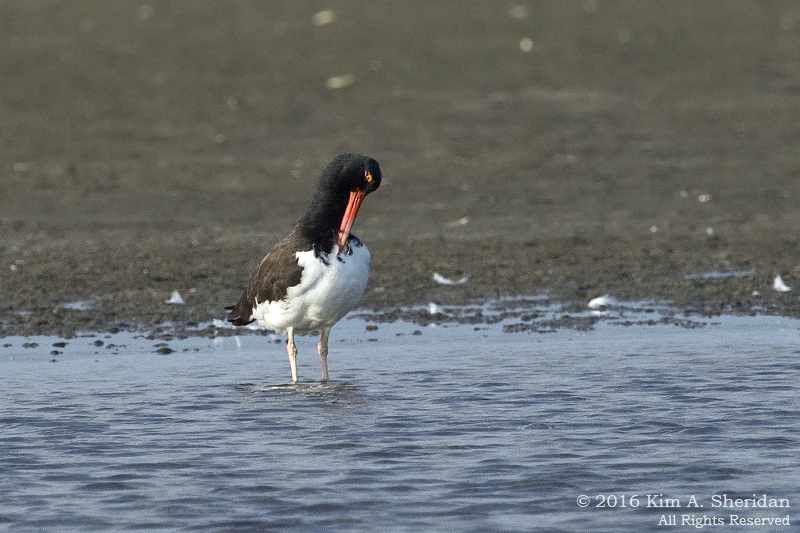 An American Oystercatcher goes to great lengths to keep those feathers clean. 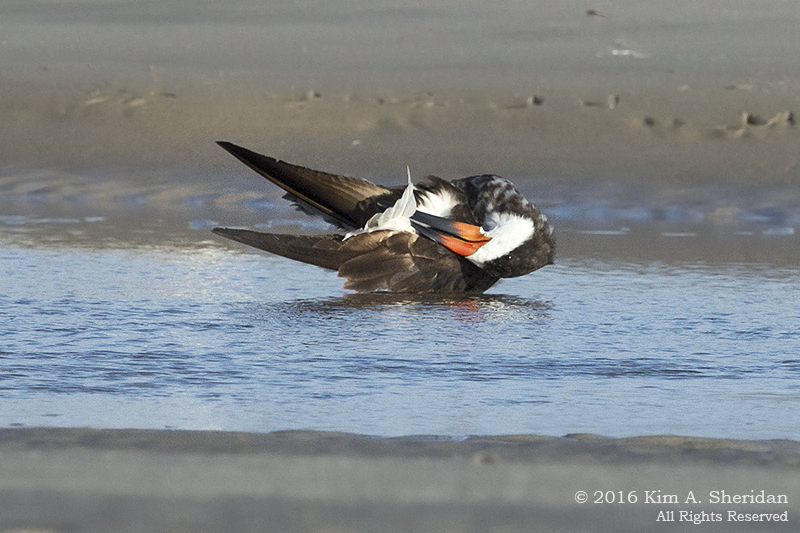 Also a contortionist, the Black Skimmer turns upside down to get those hard to reach spots. There go the Skimmers. Evening is the time for them to feed along the ocean’s edge, knifing their bills through the calm water in search of fish. 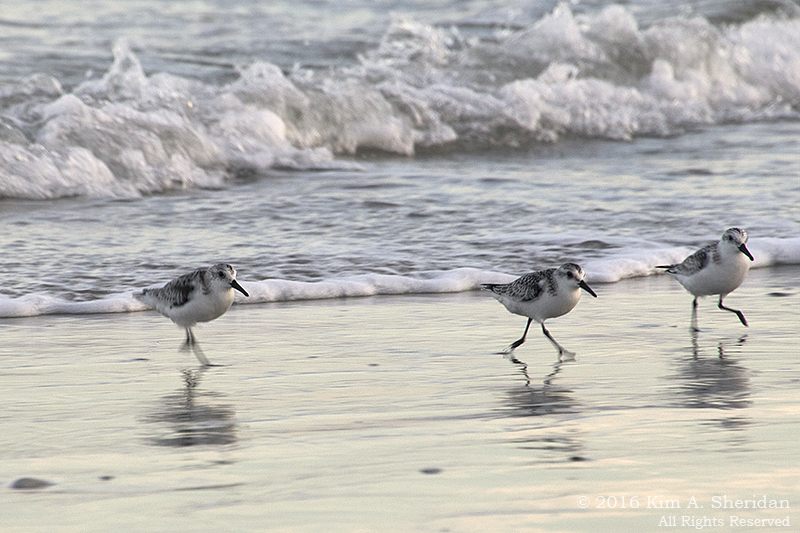 Joining the Skimmers on this lovely evening are the Sanderlings. 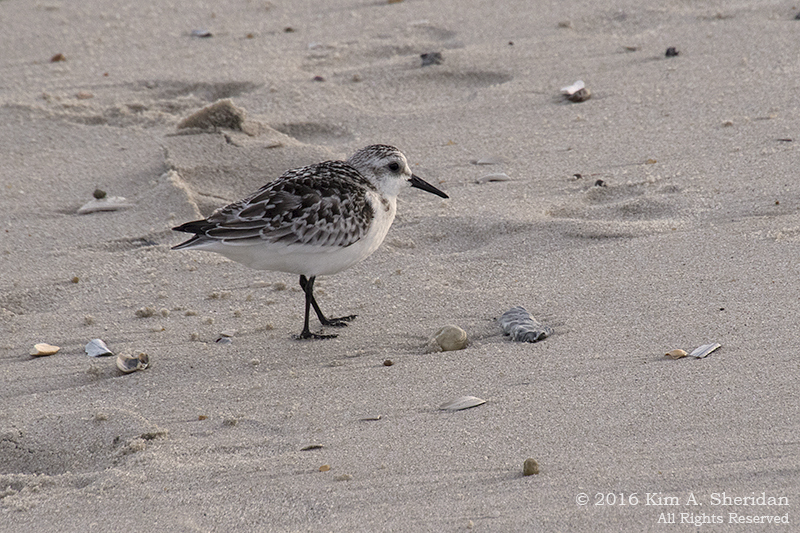 These small shorebirds chase retreating waves down the beach, while probing for tiny invertebrates and crustaceans. 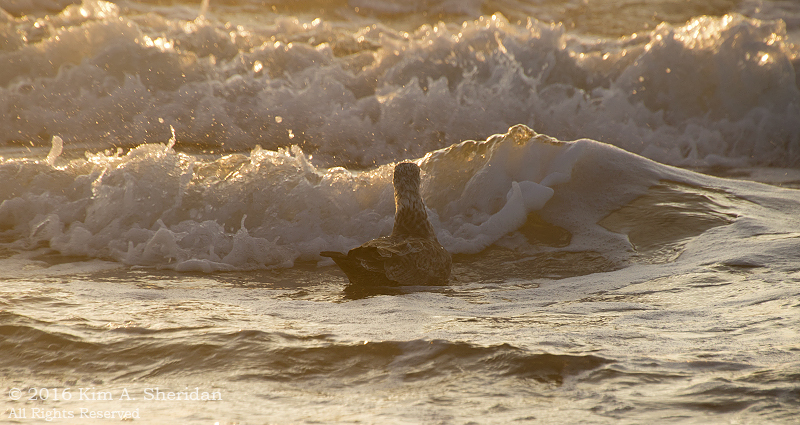 …in the sunset glow of another fine day at the beach. 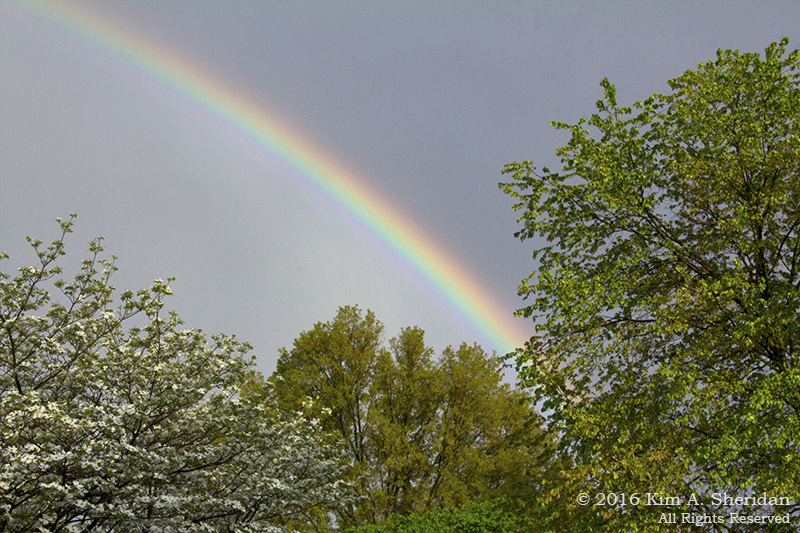 Sometimes Mother Nature throws us a curve ball. 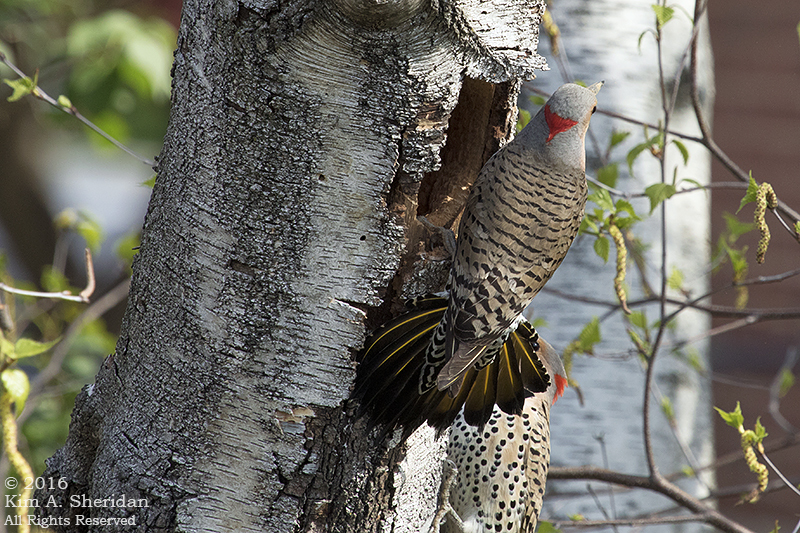 Last week I wrote in depth about the nest a Northern Flicker pair was making in my birch tree. Today I am sad to report that they have abandoned the nest. 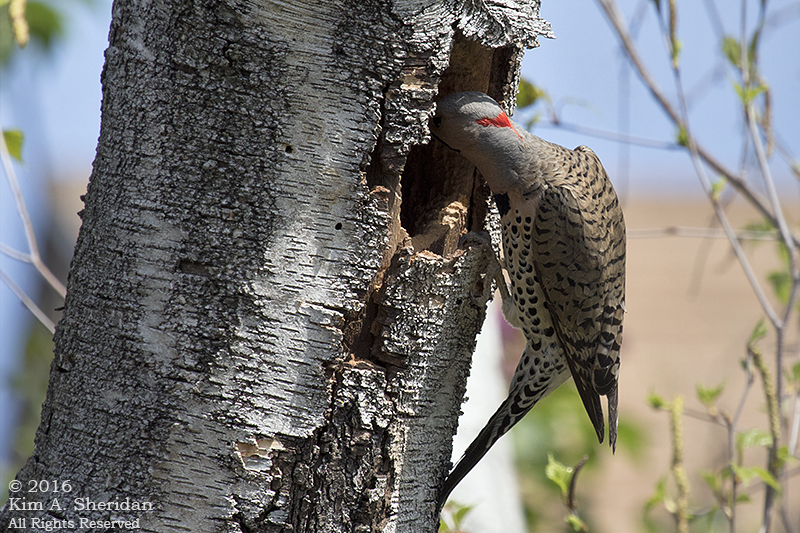 The Flickers were at the hole constantly for over a week, busily excavating and enlarging the cavity. 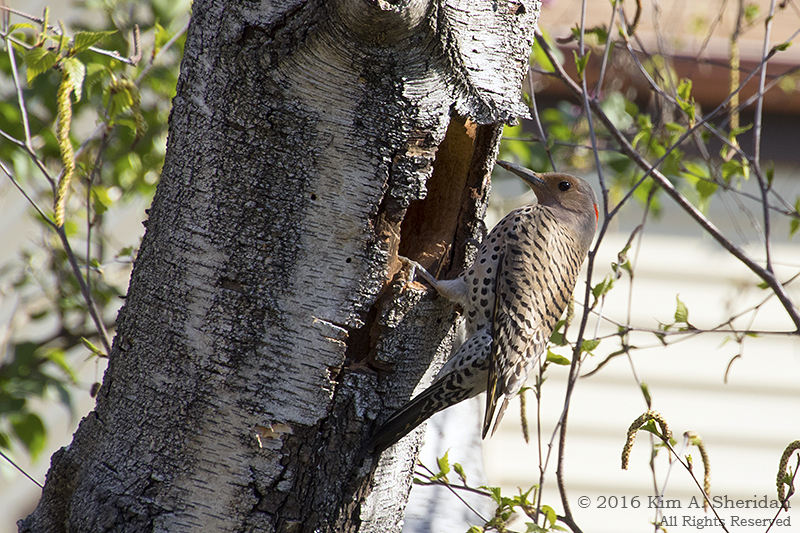 After that activity ceased, I didn’t see much of them, except for a Flicker head appearing at the hole occasionally. 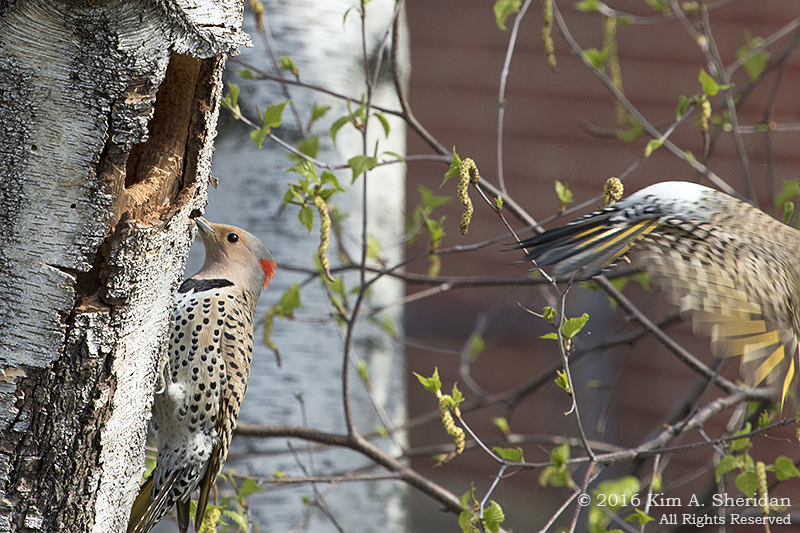 I figured the Flickers were incubating eggs and soon there would be babies. I figured all was well. 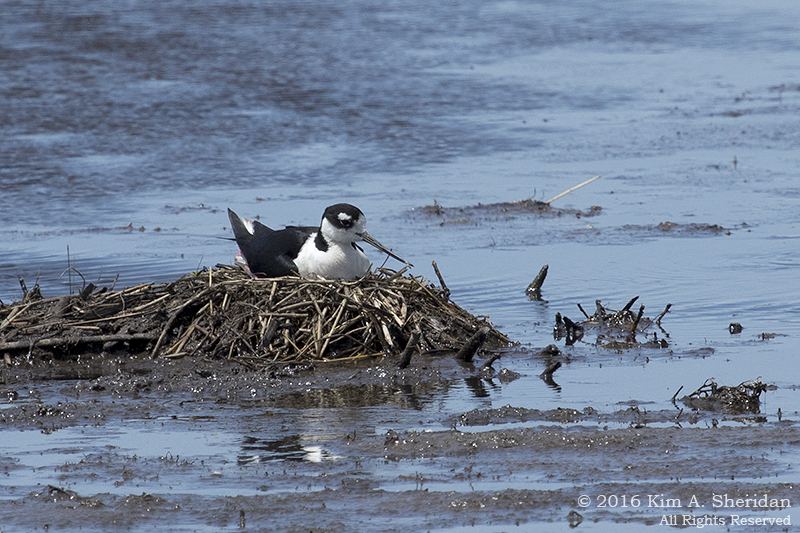 Then Saturday my friend Robb asked to see the nest. 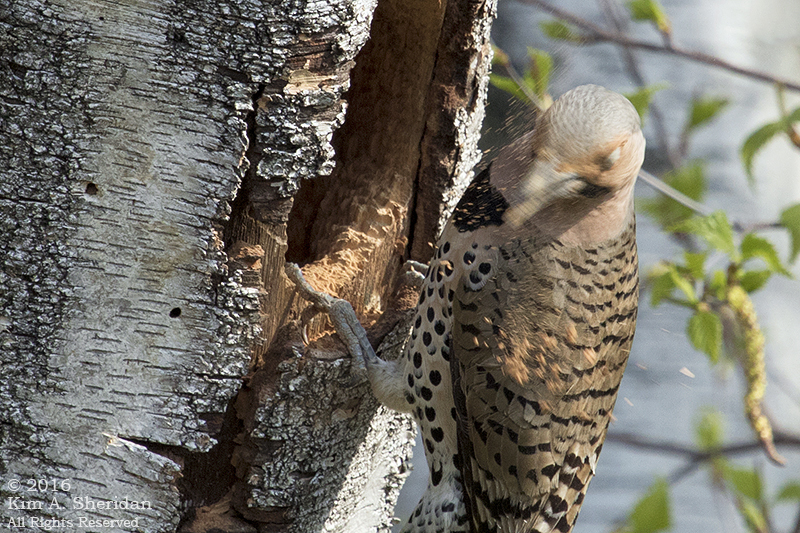 We walked over just as a gray squirrel scrambled down the tree trunk, and plunged headfirst into the Flicker hole. He completely disappeared and we didn’t see him come out. Well! This was a nasty turn of events. What happened here? 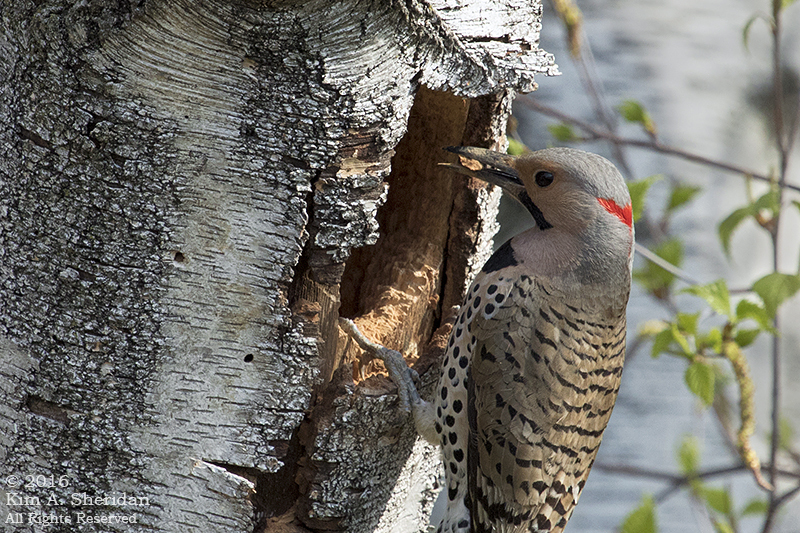 Obviously the Flickers were no longer occupying the cavity, but why? Was the female unable to produce eggs? Did too much human activity near the tree scare them off? 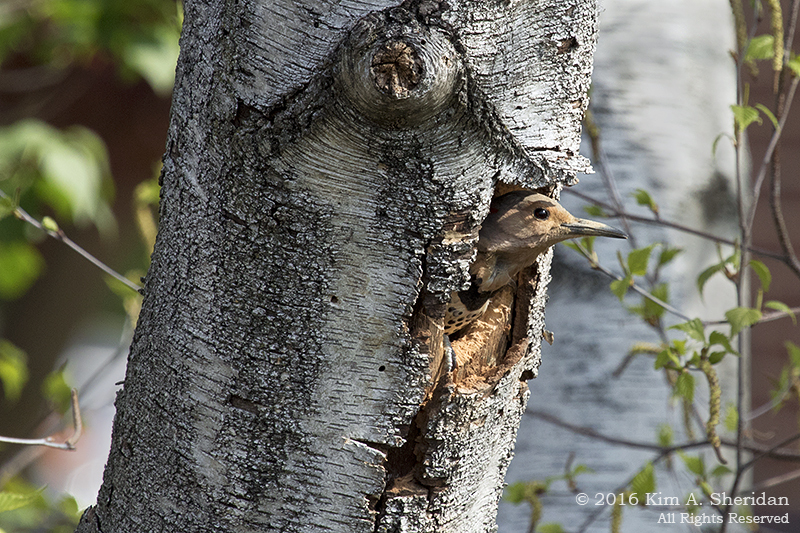 Did a European Starling, a frequent nest competitor, interfere with the nest? Did some critter eat the eggs? Was the squirrel the culprit? Squirrels will eat bird eggs from time to time. 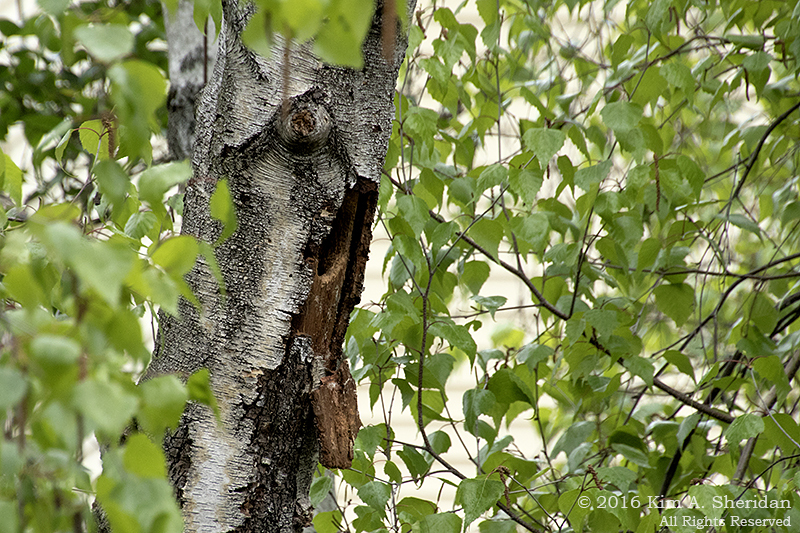 Or was the squirrel just taking advantage of the previously abandoned cavity? We’ll never know. 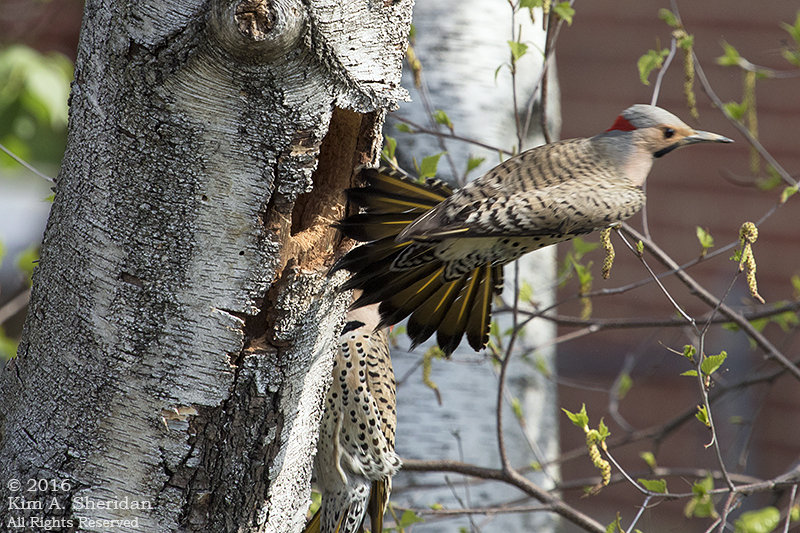 It’s sad that the Flickers’ nest failed. 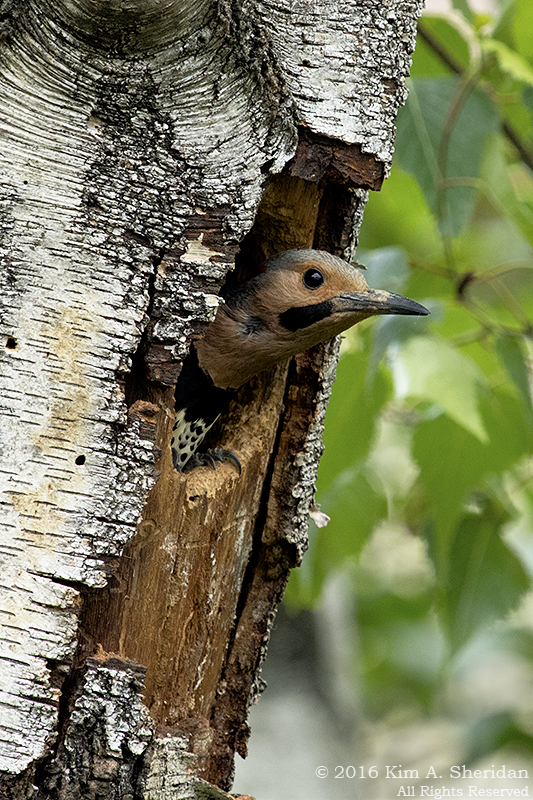 I am disappointed that I won’t get to watch baby Flickers grow up, especially since the cavity was in a terrific location for photography. This happens with some frequency in the natural world. 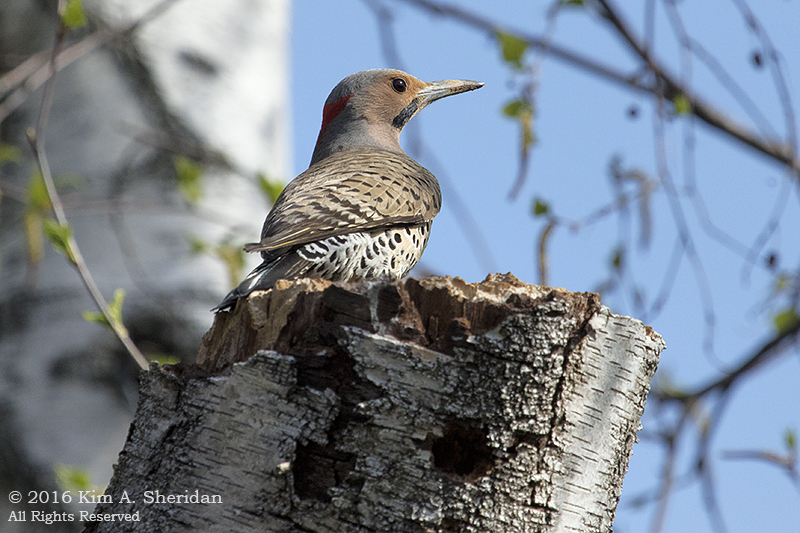 Flickers raise one brood a year, but they will lay more eggs if the first ones are lost. They expended a lot of energy excavating that cavity. 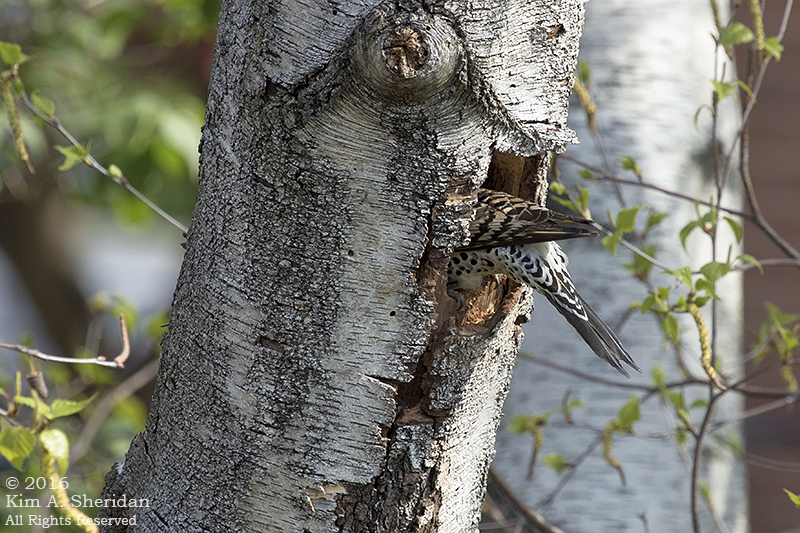 They may try again in the same hole, if the squirrels (or the House Sparrows I saw there today) haven’t moved in permanently. Or they may have to start again somewhere else. But they will start again. As I write this, I can hear the loud WIK-WIK-WIK-WIK-WIK-WIK-WIK call of a Flicker nearby. There’s a lesson for me in the saga of the Flickers. Though the past year has been filled with wonderful adventures, I have also been struggling with some old familiar failures. Self-critical perfectionist that I am, I find it extremely difficult to let go of those failures. Like the Flickers, I need to shrug it off and start again. Put yesterday in the past, and start each day anew. Life lessons from the Wild Edge.